Through six social service offices, Sacred Heart Southern Missions seeks long term solutions root causes of economic problems suffered by poor families while providing emergency aid and food to meet immediate needs. We serve the five northern counties in Mississippi: DeSoto, Tate, Tunica, Marshall and Benton. Direct Aid—food pantries, clothing, gasoline, rent and utilities assistance to families and individuals with verified need; advocacy, counseling and referral. Advocacy and Assistance - Advocacy and assistanceto eligible individuals and families applying for state and federal benefits. Community Garden—Planted and maintained by staff and volunteers in Holly Springs, our community garden provides fresh produce for the our soup kitchen and for distribution in the food pantry. Garden Café—Hot, nutritious meals provided at no charge to needy individuals and families every Tuesday and Thursday evening in Holly Springs. Meals are cooked and served by volunteers at the Garden Café, located next door to our social service office. GED - GED High School Diploma Classes in Holly Springs. HIV/AIDS Direct Ministry—Providing emergency food and aid to persons and families affected by HIV/AIDS throughout the Mid South, including northwest Mississippi, southwest Tennessee and southeast Arkansas. Project Good Mother-- A fifteen-week program, offered twice a year, educates teen mothers about childcare and parenting. 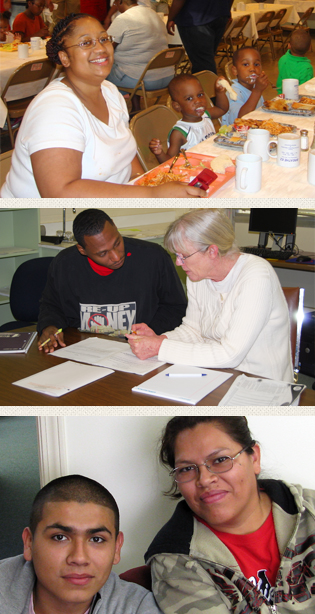 Adult Continuing Education Classes Courses designed to assist individuals and families with a variety of economic, career and family topics. A Thrift Store-- Providing gently used clothing, furniture and household items to individuals and families for pennies on the dollar. In emergencies, items are given at no cost via vouchers through our Social Service offices.